Sophisticated and compelling drama encompassing Middle East refugees and the origins of terrorism. If there’s one topic which occasionally penetrates the news agenda through the cacophony of the Brexit debacle, it’s the ongoing refugee crisis, as the displaced population of war-torn Syria continues to strive desperately to reach some sort of safety in Europe. 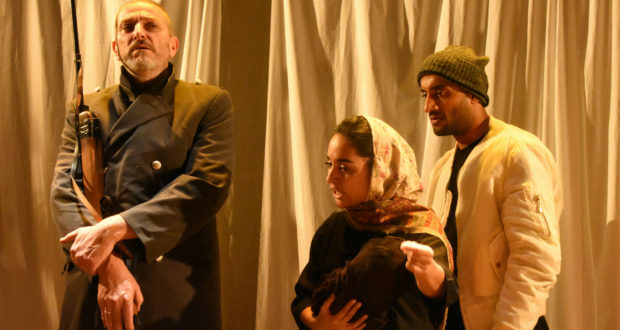 Jonathan Brown’s extremely accomplished play introduces us to Saif (Vincent Kerschbaum), Hassan (Hamza Siddique), Amira (Natali Servat) and her tiny baby, who have trekked through Egypt to the Mediterranean coast, whence they hope to board a boat to Italy, where they look forward to plenty of cooling ice cream. After a perilous journey – skilfully evoked on the minimalist set – the gang make it as far as Greece, where they come into contact with “Micky” Michaela (Erin Elkin), an undercover journalist from Northern Ireland who’s after a scoop (not of ice cream) but gets more than she bargained for. 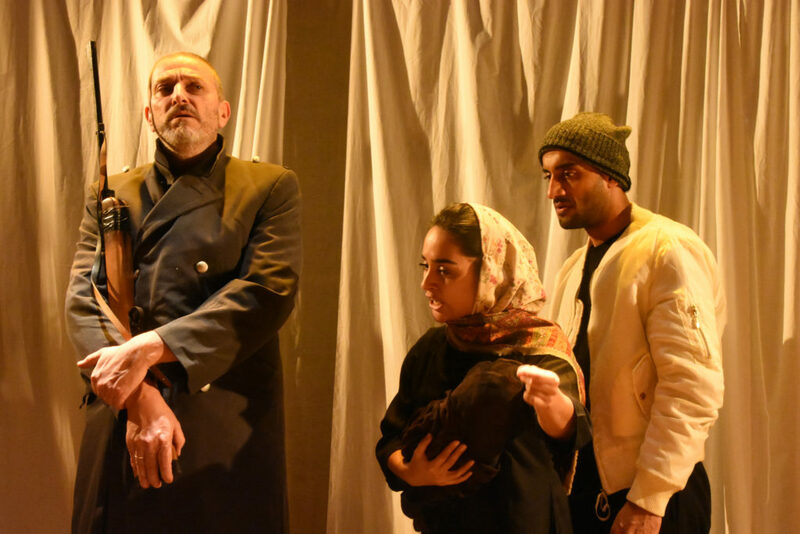 The ingenious plot goes on to explore the hidden truths of the characters, and in the second half addresses the online radicalisation of naïve young British Muslims. This storyline is prefigured in some projected webchat transcripts before the show starts, so get there early if you want to see them – though they’re not essential viewing. A superb cast (complemented by writer Jonathan Brown as a disturbingly composed interrogator) do full justice to the vivid script, which Brown also directs. He orchestrates the action with finesse, adeptly balancing a complex drama which flows between the profoundly personal and the intensely political. Plot twists are deftly handled and the play incorporates heart-stopping thrills as well as surprising shafts of humour. Playing until 16th February at the charming Tara Theatre, this is a humane and intelligent play set in a pre-Brexit world in which Britain was still an attractive destination for those escaping more pressing issues than whether our baristas have the right accent. Nathan is a writer, painter and semi-professional fencer. He fell in love with theatre at an early age, when his parents took him to an open air production of Macbeth and he refused to leave even when it poured with rain and the rest of the audience abandoned ship. Since then he has developed an eclectic taste in live performance and attends as many new shows as he can, while also striving to find time to complete his PhD on The Misogyny of Jane Austen.